One of our regular London WC2 | Covent Garden studio trainers, Cat Lane has been practising Reformer Pilates for 9 years as part of her training as a dancer. Read our chat with her below. TP: What is it about the Tempo Pilates method you enjoy the most? Cat: I think the Tempo Pilates method has a great blend of fast-paced reformer work while still really connecting to classical technique. The music always helps to motivate as well, and distract from the burn. TP: What’s some advice you have for a student new to Tempo Pilates? Cat: Don’t be afraid to ask questions to understand why we are doing a certain move. The more you can connect your mind with the movement, the more focused and effective you can be. TP: What’s a misconception about Pilates you would like to debunk? Cat: That it is Yoga! I think both practices are great and very complimentary but completely different. I also love when people realize the potential to really push themselves further and further in Pilates and understand that the basics are the building blocks and they can take it as far as they want. TP: Tell us your top tips for students to correct form during class. Cat: Resist the tendency to rush through an exercise. Try and follow the pace your trainer has set so you have time to give your form full attention. Don’t be overwhelmed if you feel there are so many corrections to think about and try and focus on applying one or two at a time. TP: Besides Pilates, what are some other forms of exercise you enjoy and can recommend? Cat: Yin yoga is amazing for deep release in the muscles especially if you are battling injury, and any form of dance whether you’re taking a class or just dancing socially- it always makes me feel great! TP: What are your best motivational tips to maintain a fitness routine? Cat: I think having a plan and structure are great motivators, booking into a class in advance or planning to meet a friend to work out can help you keep your exercise regular. TP: What are your favourite places in London to eat and drink? Cat: Great question! If you live south, Streatham Wine House is an absolute little gem. My sisters and I swear by a little Italian in Kennington called Maximo, it doesn’t look like much but the food is incredible. Apart from that I love markets so often go to Borough or Brixton to meet friends. TP: A fitness apparel/accessories brand whose products you enjoy? Cat: I have to stick with Lululemon I’m afraid. I’ve tried a lot and nothing else feels as good or last as long but I would say find out when they are having sample sales as you can pick up some great bargains. TP: Your favourite song from our May playlist? Cat: The warm-up: Make Me Feel by Janelle Monae. TP: Who is an inspirational figure you look up to? Cat: I’m always inspired by ordinary people who have lived extraordinary lives so I’d have to say people like Jackie Pullinger and Corrie ten Boom. TP: What’s a quote or saying you like to live by? Cat: “What good is it for someone to gain the whole world yet forfeit their soul” keeps me focused on what’s important. TP: What first got you interested in reformer Pilates? James: I found the Pilates method and absolutely loved it. I taught mat Pilates for 4 years and finally, in addition, added reformer pilates to my qualifications. It was a natural progression to want to learn the large Pilates apparatus. This year I’ll be adding the Pilates Cadillac to my belt. James: I think the first half of the class being a repertoire aids the students to see progression within the class. Plus, greater mind-muscle connection as the repetition of movement strengthens neural pathways, which helps us to learn new skills and develop our bodies. TP: Tell us about some of the benefits you’ve found Pilates can provide men in particular. James: Pilates holds the same benefits for everybody. Men, women, young and old. I feel with regards to men, Pilates may hold a stigma that it is more for “women” when in fact Pilates was created by a man to fix his body. Add the reformer and you’ve got an amazing workout. The benefits I personally found was the change in body shape because I’d lost lots of weight but still didn’t have a nice body. Pilates tightened my transverse abdominal muscles which in turn gave me a strong core and a smaller waist. Winning! TP: What are your best tips to boost energy for fitness? James: Get plenty of sleep and keep hydrated. Try to limit phones and tablets. Our screens emit a specific type of blue light; this light keeps us awake and boosts reaction times by suppressing the release of the ‘sleepy’ hormone, melatonin. Try not using your phone for one hour before bed and try not to have the phone next to your bed while you sleep. As a result, I found my sleep improved 110% by doing this. TP: As an East London local, what are your favourite places to eat and drink? James: For a Sunday roast I love The Talbot in De Beauvoir. Drinks at Howl At The Moon in Hoxton and Shoreditch House. TP: A recent London discovery you’d like to share? James: I found an amazing coffee shop called Black Truffle in Belsize Park. The coffee is amazing and the cakes are to die for. If you’re in north London look it up. TP: Your favourite song from our April playlist? James: Me and My Toothbrush – Sister. I love teaching to the beat. James: Benjamin Degenhardt. From the start of my Pilates career, I have found him a total inspiration for my Pilates practice and teaching. TP: What’s your best tip for beginners to Tempo Pilates? James: Nobody was good at anything without practice, therefore give it a go. 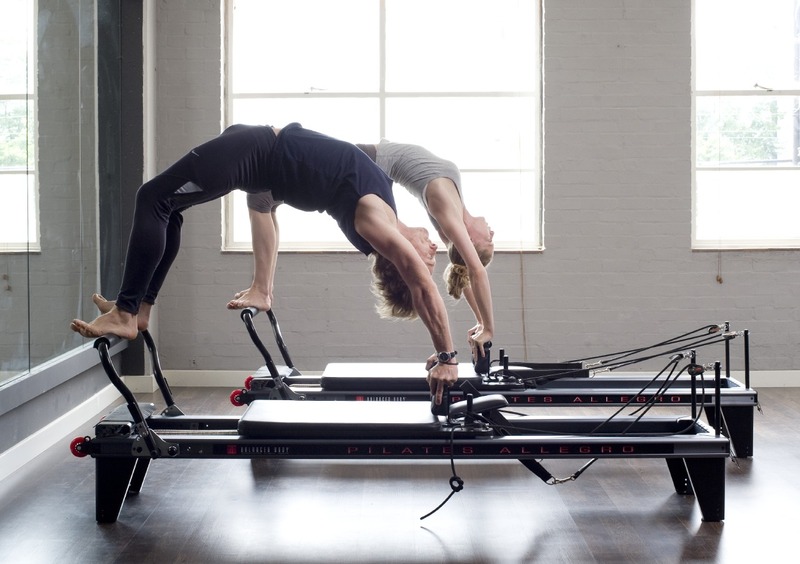 Book a class with James at our London E8 | Hackney or E1 | Shoreditch reformer pilates studio. Tracey, a London E1|Shoreditch regular, comes in with an amazing attitude and never skips a reformer pilates class despite her busy schedule. Read our interview with her below. When and what made you decide to join Tempo Pilates? July 2016. I was tired of my stressful commute and needed a reason to wake up earlier. How many times a week do you come? The friendly professional atmosphere of the studio, instructors and that I generally feel like I have extended myself beyond my comfort zone – the benefits are tangible mentally and physically. What other forms of exercise do you enjoy? I do Pilates whenever/wherever, including when I travel across the globe (I have not quite found anything like Tempo Pilates reformer classes), lots and lots of hiking and walking. What is your favourite Tempo Pilates playlist Tune? Hmmm ..just one..probably Sugar – Robin Schulz it supports the longest plank. What’s a great film/exhibition/concert you’ve seen recently? Golden Kingdoms at the Getty Museum, click here>. Any favourite local places for food and drinks you can recommend? Not sure about local… Millies Lounge at The Ned. French toast for brunch (post an Up-Tempo class). What motivational quote do you associate with? What were your new year’s resolutions for 2018? I’m not really a resolutions person. I rather keep eye on my personal goals throughout the year. An all-around entertainer, Jessica has been with Tempo Pilates since 2016 and known for her holistic approach to teaching. She loves to use Reformer Pilates as a way to train people with all kinds of physical and wellbeing needs. Read her health and fitness tips and London recommendations below. TP: What is the most valuable thing you have learnt from all of your experience as a teacher/entertainer? Jessica: To breath full and wide. As both a teacher and an entertainer we talk about breathing so often, but it is so important. It can change intensity, it can assist, it can calm, and it is totally necessary (obviously). I’d encourage everyone to take the time to have 5 minutes to just relax and breath every day! TP: What’s a quick tip to help maintain good posture throughout the day? Jessica: Pay attention to your shoulders, especially if you’re sat at a desk. Taking the time to roll your shoulders back throughout the day will encourage you to sit a little taller with the collarbone open and smiling. Jessica: A constant balance of well-rounded eating and treating yourself occasionally. I personally like to fuel my day with a lot of fruit and veg finding it’s the best way to boost energy and keep it going throughout the day. Try to carry a little snack pot (usually containing nuts and dried fruit) for when I’m out and about. TP: Do you have any tips to combat the winter blues? Jessica: Get on your coat/scarf/hat/boots. Make sure you have a pack of cards on you then get a friend and go for a nice relaxed walk with the end goal being a red wine in a pub! A little bit of exercise followed by a reward (this was me in Edinburgh over new year, epic walks followed by cosy pubs). TP: What’s a lesser known or secret place in London you’d like to share? Jessica: Great question. It isn’t really a secret place but I love to walk down through Alexandra Palace into Crouch End- I lived there for years and it’s my favourite place in London. TP: What’s your favourite song from the Tempo Pilates playlist? Jessica: I couldn’t pick just one- I really like Try it by Groove Motion and the Feeling Good by Nina Simone remix. I always love the playlist! TP: A good film/show you have seen recently? Jessica: For a feel-good film, “The Greatest Showman” (go Hugh Jackman!) But there are so so so many good ones at the moment!! TP: What is a quote you like to live by? Jessica’s classes are fun, friendly and suitable for beginner and intermediate students alike. She can be found at the London E8 | Hackney reformer pilates studio on Monday evenings, Tuesday and Thursday mornings, and in our WC2 | Covent Garden reformer pilates studio on Friday mornings.